Small, atomic commits makes it easier for code reviews, browsing the history and reverting changes. Life happens and commits can touch more lines and files than I want but the changes committed should be distinct. "Don't mix your apples with your toaster." TL;DR: Use git add -i or git add -p. Stage the files you know are related. Break other mangled changes in files into smaller chunks (known as hunks) using patch mode. Stage. Commit. Do it again. Be careful. In this post I am going to show you how to craft your changes into small atomic commits. This means that you are going to break up your changes into separate pieces of work and commit them. It was brought to my attention in Reddit by WetDynamics that "atomic commits sound nice in theory but in practice you end up with 100 commits of "extracted foo into a method" or "refactored bar to make it more readable". Does it really make your git history easier to grok than a single commit focused on a feature?" So I wrote about it. Know what you are doing. If you make a mistake by omitting a file or leaving out a chunk of a file you will have a broken commit. Doing this is much easier when you keep your changes as small and simple as possible. Although you can scale up, the more complex your changes are, the more your brain has to work and the larger the chances are of you making a mistake. Commit the files that are related. Make a copy of the file with multiple changes, revert the other changes in the file, add the new changes to the file and commit it. Put your changes back for the next commit. No more stone age processes. You can use the interactive mode approach to add the files you want and choose parts of the files you are interested in committing. You can use the patch approach directly. 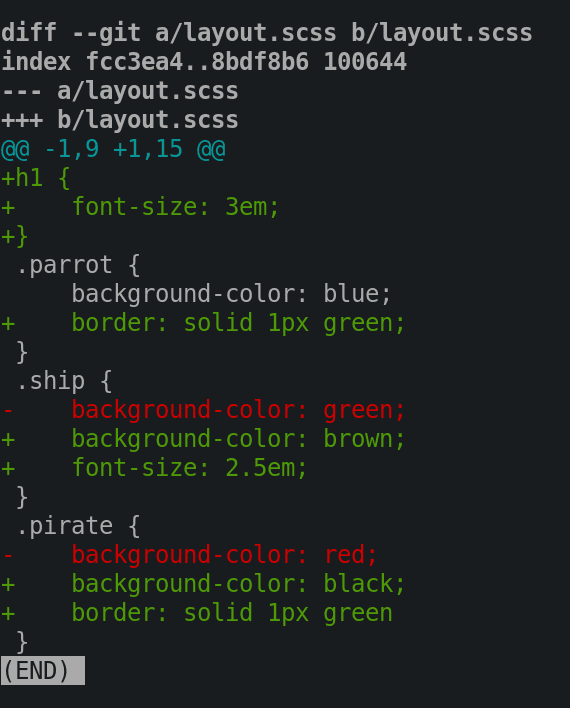 git diff layout.scss will give you the diff for that file. You will notice some seriously stylish changes that I have made. Quickly check the status of the file in git status and see that it is already staged. This file must not be committed in its entirety so the file must not be staged. This is the meat of what I want to share with you. I am going to show you how to stage files and parts of files to craft your commits. Get started with git add -i or git add --interactive See a status screen which is like git status on steroids. To the left you have staged changes. If the file hasn't been staged yet it will display unchanged. To your right you have unstaged changes. If the file is fully staged then it will display nothing. If there are none you will stay in the What Now> prompt. If there are files to be staged then you will enter the Update>> prompt. Enter the numbers of the files or the highlighted letters and press ENTER. The files are shown again. This time you will notice asterisks next to the files you have selected. They are the one's that will be staged. Rinse and repeat this process until you are happy with the files you want to stage. Press ENTER to stage the files. 3 or r will do the opposite of update. It will unstage (or revert) your changed file. This is equivalent to git rm --cached <file> The process is exactly the same as above except you will be in the Revert>> prompt. 5 or p will allow us to selectively choose parts of a file (known as hunks) and stage just that part. You will be in the Patch update>> prompt. Same story as before. I'll get to this in a bit. You are presented with hunks. The layout.scss file below only has one hunk. Uh, not ideal because I want to break it up into atomic commits. s - split the current hunk into smaller hunks <-----Booya! Git was able to split that file into 4 hunks which you can choose to stage or not. Stage the ones that are relevant to your commit and leave the rest for now. You won't lose those changes. When a hunk cannot be split you will see the following in which can you can edit the hunk. To wrap it up, select the related files and create the related hunks. Stage them. Quit and commit. Do it again for the next change. You can also use git patch directly. git add -p or git add --patch will take you into patch mode.